SIR MIKE classroom activities available for download on 4 Kids to Do page. Click here for Sir Mike on Scholastic Library Teachers website. At the new Spout Springs Branch of the Hall County Library System, young readers have their own realm handpainted by local artists! photo by Donna H. BowmanHere I am with the very cool dragon in the Mythic Creatures exhibit at Fernbank Museum of Natural History (Atlanta). Roar! So begins Mike's adventure in his own backyard. What could be moving in the bushes? Mike is convinced it's a formidable dragon, and he shows off a series of knightly moves in preparation for battle. What finally emerges is a surprise. Written in humorous rhyme for ages 4-8, the story invites young readers outside to play in this Scholastic Rookie Reader. David Murphy's lively illustrations capture Mike's adventurous spirit. Where did Robyn get the idea for Sir Mike? Her son engaged in plenty of imagined knightly adventures when young. In fact, Robyn painted his attic bedroom to look like a castle--stone by stone. Her brother's name is Mike, and her son has a good buddy named Mike. And it's just a pretty cool name, don't you think? 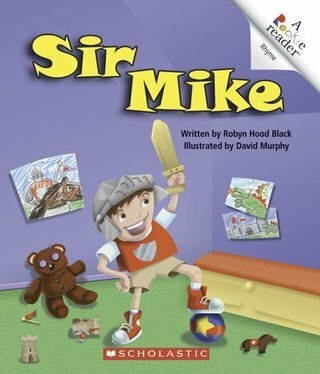 SIR MIKE was reviewed by a young book reviewer, Sir Books-a-Lot. Appropriate, right? Thanks to this ambitious young reader and blogger! Happy to be included in your realm. I enjoyed sharing "Sir Mike" with the knight guarding the door in Annabella Range's media center at New Prospect Elemenatry School! Sir Mike comes to Storytime! Sir Mike was especially honored to be included in Hall County Children's Librarian Gail Hogan's dragon storytime, celebrating the opening of the new Spout Springs Branch library! "This book is interesting, engaging and has a great plot that can be used to work on many varying leveled skills!" Jen Schneider, Kindergarten Teacher and host of Teacher Talk Radio. "We love the book because we love it." "The book is very funny."